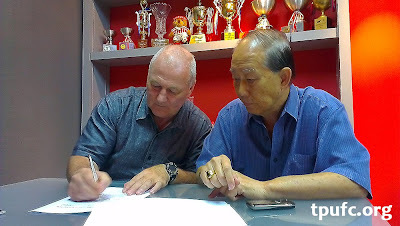 Like any notable figure in the past, his presence at several games during the closing stages of the recent concluded S.League 2012 season had speculations sparked within the fraternity that would one-time Etoile FC coach Patrick Vallee (pictured left) coming back in the scene after a two-year hiatus. 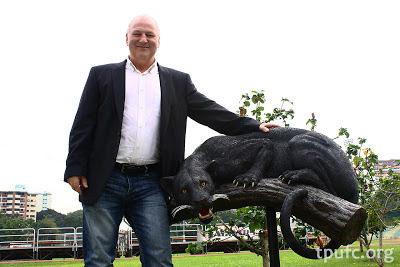 After all, Nenad Bacina, who reportedly stepped down from his post as Hougang United's coach recently, was spotted by this blogger towards the end of last year's campaign at Choa Chu Kang Stadium. "I will be heading to Indonesia." said coach Neno (as Bacina is affectionately known as) to me, after I yelled out for him from a distance and the next thing we all knew that following a few outings at other games, the former Woodlands Wellington coach helmed the Cheetahs until of late when he was linked to the vacant post at Tampines Rovers. So going according to the preceding script, it was not a surprise at all to see the Frenchman put his signature on the dotted line of the paper that confirmed him as the new man-in-charge at Tanjong Pagar United Football Club (TPUFC), as depicted in a snapshot (pictured above) released by the club yesterday afternoon. Sharing his thoughts in a press release made known to the media by the Jaguars office, Coach Vallee explained his decision to return to the S.League. "I have always wanted to coach a local club in Singapore and really want to be involved in Singapore football." said coach Vallee. "As a club with rich history, I believe TPUFC will be a very good challenge for me. "My ambition for TPUFC is to improve the club football and reach better standing in the league table." added the grey-haired tactician, who masterminded the Stars' (Etoile's nickname) achievements on its debut season in 2010 with a league and League Cup double. While no details were being divulged on how coach Vallee would want to do to see him achieve his targets, but he emphasised his football philosophy of playing short passes and good team movement that he hopes to see his team perform based on those principles. "Supporters want to watch a team play good football, and I also want to develop a winning mentality for the team. "To me, if you want to be ambitious, you must have a winning mentality." "I hope the supporters will come to Queenstown and support the club. Most importantly, I want the supporters to enjoy coming for games." he said in the same release. It was understood that coach Vallee will return to France to sort out some issues, and will be back in town early next month to begin his new appointment.